My long-term forecast expectations remain as of more than a year ago that Gold ultimately targets a trend towards $1800, a trend that is pending a break above $1375. As for Gold in 2018, a break above $1375 should see the Gold price target $1500. The gold price having hit my resistance area of $1375 is now under going its first significant correction of the year before it next attempts to break above resistance of $1375. So unfortunately for the Gold bugs, February looks set to be a month for the Gold price to correct and prepare for that next assault on $1375, which means to expect the Gold price to go much lower than the current $20 or so retracement ($1350), likely falling to below $1300, where an eventual bottom in the $1250 to $1280 support zone. And with no significant deviation against my forecast expectations so far an in-depth analysis at this point in time is unnecessary. 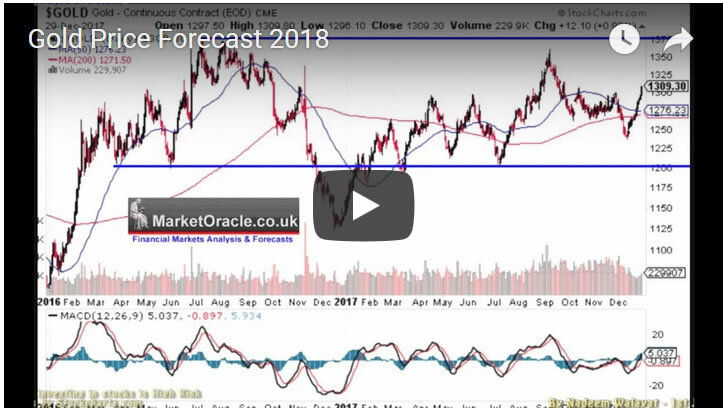 However I will shortly be completing an in-depth analysis of Silver, so ensure you are subscribed to my always free newsletter and youtube channel for this. As for the gold miners, GDX remains firmly stuck in a trading range that ultimately should follow a gold price breakout higher, though I expect things will get a little painful for Gold bugs during February's correction.